Comet C/2017 S3 has an eccentricity of 1.0000787, which makes its orbit hyperbolic. Its inclination is about 99 degrees to the plane of the solar system. This makes it very unlikely that it a comet from our own solar system, kicked into a hyperbolic, sun-escaping orbit by a close encounter with Jupiter. This strange comet suddenly flashed on July 2, 2018. Michael Jäger took the above picture of the comet's expanding green atmosphere shortly after the outburst. The gas cloud around the comet's nucleus is about 4 arc minutes wide," says Jäger‎. That means the comet's atmosphere is 260,000 km in diameter, almost twice as wide as the planet Jupiter. Barely a week later, the comet fizzled, dimming almost as much as it had brightened. Then it exploded again, its green atmosphere ballooned in size, large enough to swallow Jupiter twice. Michael Jaeger captured the comet's newly-formed tail on July 20, 2018 see GIF animation below. 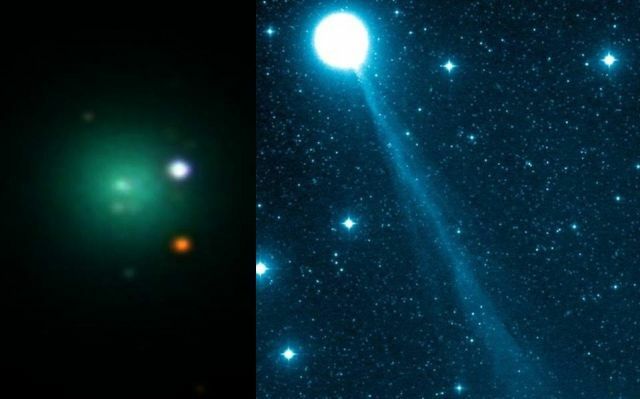 Why is Comet PanSTARRS so unpredictable? Is it really a comet or is it something like Oumuamua? They suggest that probably it has never felt the heat of the sun before. The comet is arriving from the Oort cloud, a vast reservoir of fresh comets in the outermost solar system. And this is its first time among the inner planets. Unfamiliar warmth is making veins of fresh ice pop and fizz as the comet approaches. It is expected to brighten many-fold as it approaches the sun inside the orbit of Mercury in August, a narrow open-ended path that will ultimately fling it back to the outer solar system, reports spaceweather. However, stay tuned for the unexpected. If im in so cal when will i be able to see it?